We had been talking to Steve Warren about gathering a few pictures together from some of the more obscure bits of Dow, so with an afternoon midweek trip in the offing, I suggested Albert Hall to Adele. I hadn’t been to this far end of Dow for about 8 or 9 years, so a quick read of my old report from the club website gave me a few bits of useful info…low to right at the final choke…..follow bang wire….look for fluorescent tape……and not much else. A slightly battered pair performed the customary in-car change at Park Rash in freezing, but dry conditions, taking no chances of getting cold with double neoprene, plus woolies for the walk in. Adele in the fine entrance series. Water levels weren’t too bad and the clarity allowed us to spot a few nuggets of galena amongst the shingle as we passed the familiar landmarks towards the second choke, normally a point to turn around. A quick poke in the roof and then back to my notes…..yes a low crawl and squeeze through a wet section promised a little space beyond as I beckoned Adele to follow. Wet sections with diversions to avoid blockages soon brought red bang wire into view….success! 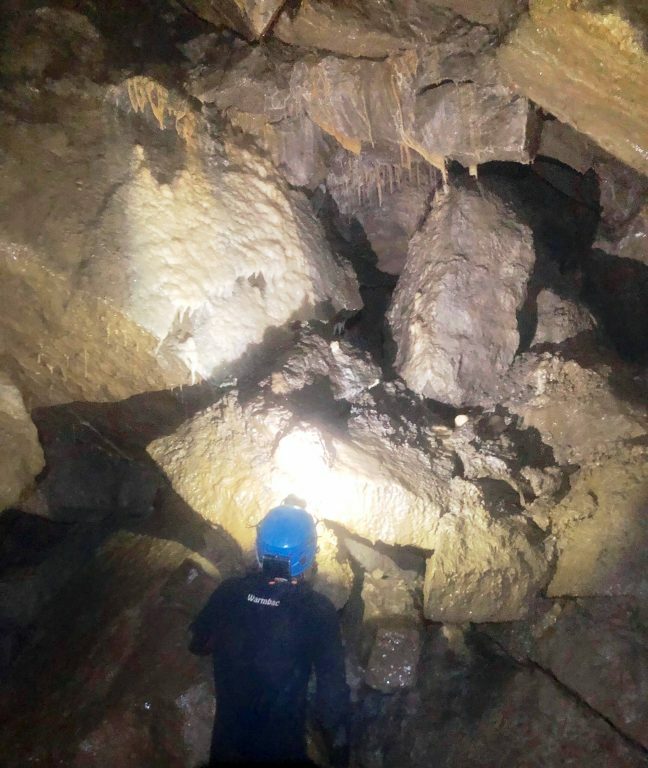 More meanderings with a few awkward sections…..passing a calcite window…..an undercut stal column, cracked due to its position alarmed Adele somewhat…..don’t pull, push was my advice and soon the infamous scaffolded section appeared. All credit to Edward Whittaker et al., for constructing this upwardly-mobile wonder. Passing the still in-situ circular saw blade, a few stones rattled down…..don’t worry Adele, from my feet, not from the roof….almost there (I hope). A final squeeze around a bend and the magnificence of Albert Hall was attained! In truth this is nothing more than a hole in the choke, with some alarming perched monsters above. Me descending from Albert Hall into the choke – pic by Adele. With Adele safely up, she felt the need for some calming substances stashed in her helmet and we took a few pics of the calcited wall opposite. A healthy flow of water issued from below this feature, but we felt we had endured enough, knowing that Denis had decreed the small section beyond to be dangerous…..enough said. 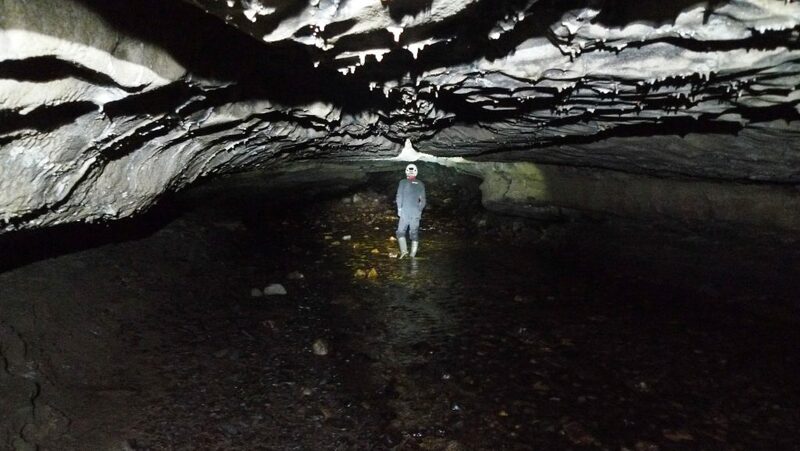 Me surveying the attractive bit of the chamber! Pic by Adele. 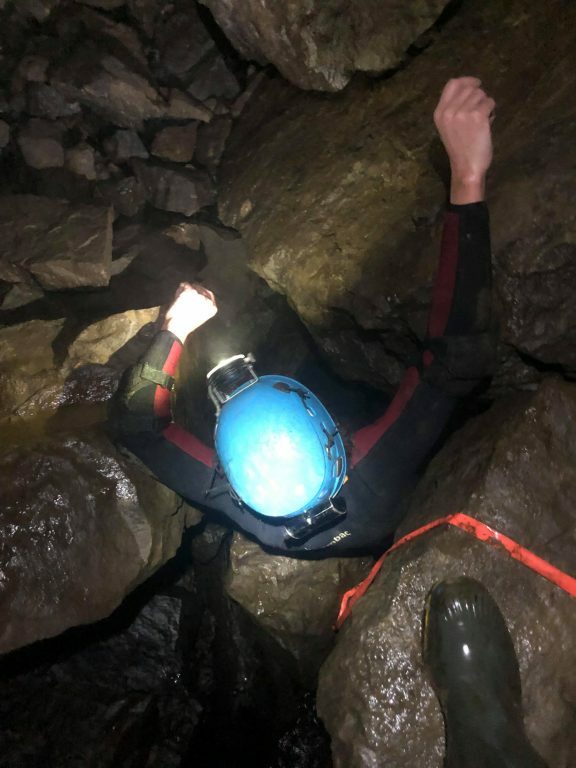 We were keen to get out, taking time to clear the scaffolded area in sections to avoid any calamity and with no route-finding issues at all….surely a first for this team…we were soon out into the cold, dark night. Mercifully the wind had dropped and the change was not too painful, before a couple in The Bluebell.